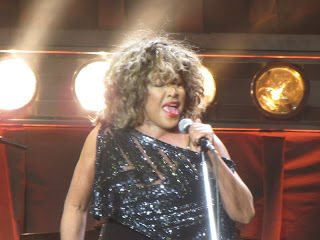 After watching Tina perform in Toronto last December, I did not think life could get much better! 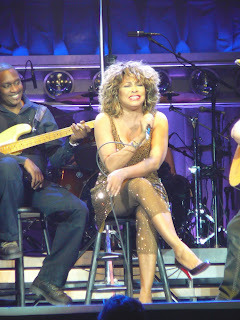 Then my wife suggested we go to Europe for the first time so that we could see Tina in concert again. ITTF president Elle was instrumental in assuring me that we could get fan club tickets, so we made plans to go to London for the March concerts. When we arrived, I realized I was not the only one who had the same great idea. We met Eren, who had journeyed from San Diego, California. There were also girls from Scotland and Plymouth England, Anja from Germany and long time fan Lucas. Of course Elle was there, and many other fans. 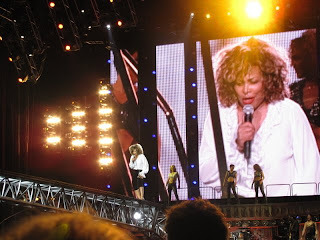 The shows were amazing: Tina looked, sang and danced superbly, the lavish set changes were incredible, the band rocked on nonstop, the backup singers had great vocals, and the dancers were perfection in their movements and the way they complimented Tina's performance. Several fans, including myself, got to meet Philip, one of the Ninjas; they really have great martial arts moves. 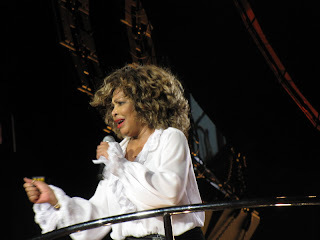 The fans were extremely enthusiastic, and you could tell Tina appreciated it. 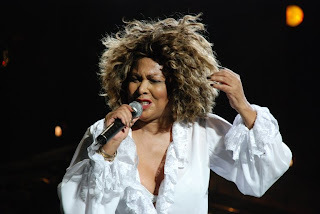 She said "the audience gave her a special gift by singing 'Lets Stay Together' along with her.' 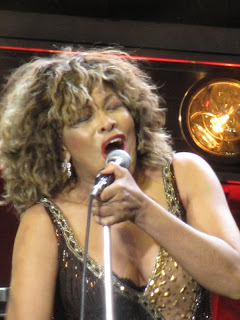 At Tina's coaching, myself and other fans screamed "What's Love Got to Do With It,..., until we were hoarse. 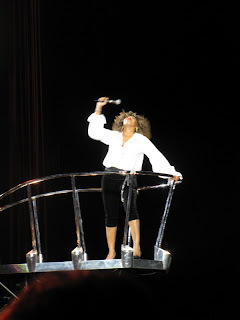 Anja, aka "Tueffelberta," brought signs such as "Queen of Rock" to hold up as Tina passed over the audience on the crane during "Nutbush." 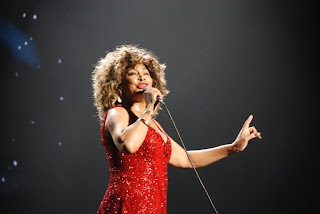 At least 100 fans in the front rows held up signs saying "THANK YOU" as Tina sang her finale; the sea of signs swayed to the music of "Be Tender With Me Baby." 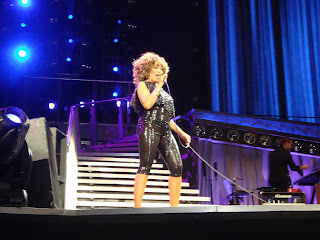 On the night of the March 8th show,Tina apologized that she had a bit of a cold, but she could not disappoint; She gave 200%, belting out each and every song without missing a beat or dance step, and only an occassional small cough in between songs let on that she was really getting sick and would have to cancel the next 2 shows. For the concert on my final night in London, I made my own sign with pictures enlarged from the Toronto concert. 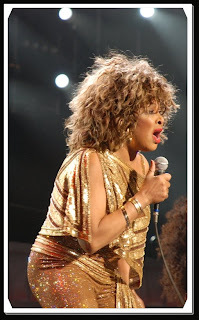 It read "Thank You Tina, For an Amazing Show." 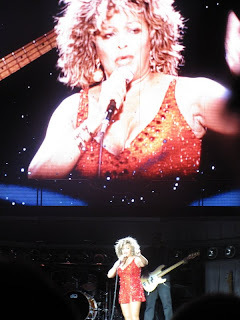 I held it up as Tina passed directly overhead during "Nutbush." She saw the sign, pointed down at it and smiled at me. 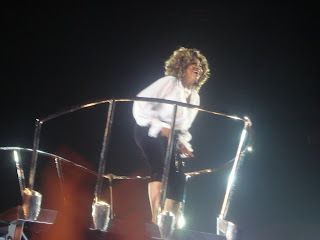 And that is a moment I will always remember. 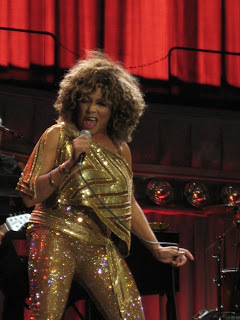 Tina once said, "I Always Seem To Get the Best Out of London," and that certainly sums up my experience seeing her there! Labels: Dublin 26th MarDublin 26th March 2009 - made by Alwyn. Labels: Dublin 26th March 2009 - made by Alwyn.